On January 24th, the band will assemble at The House Of Blues Anaheim for their annual winter assault. This marks the band's fifth year performing annually in Anaheim. The night will include several special guests as well as feature music from their self-titled album and their recent sophomore album, Volume II - Power Drunk Majesty. 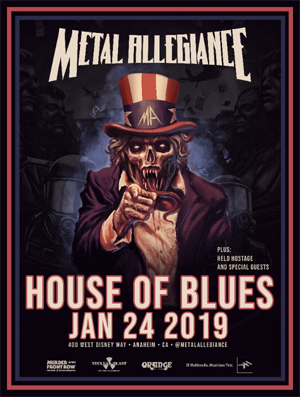 John Bush comments, "Looking forward to my third METAL ALLEGIANCE show - that I am participating in - at the House Of Blues. It's going to be metal mania, again! And we're going to do different songs this time. Not going to tell you what it is... just be ready for a little surprise. The guys are amazing and I have a great time... every time. Be there!" Bobby "Blitz" Ellsworth comments, "From the East to the West and all in-between… MA bangs Cali in January, Twenty Nineteen. So one more time, Anaheim make all it can be… if Menghi’s Long Island don't sink into the sea." In METAL ALLEGIANCE fashion the band will see an all-star line-up including the core four as well as Andreas Kisser (SEPULTURA), Mark Osegueda (DEATH ANGEL), John Bush (ARMORED SAINT), Chuck Billy (TESTAMENT), Bobby Blitz (OVERKILLl), Trevor Strnad (THE BLACK DAHLIA MURDER), Mark Tornillo (ACCEPT), Phil Demmel (MACHINE HEAD), Alissa White-Gluz (ARCH ENEMY) and Doyle Wolfgang von Frankenstein (THE MISFITS). The night presented by NUCLEAR BLAST will open with HELD HOSTAGE as well as special guests. Pre-sale tickets will be available for purchase on Wednesday and Thursday via Ticketmaster. General admission tickets will be available for purchase to the public on Friday HERE. 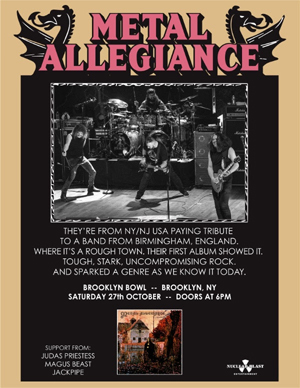 On Saturday, October 27th METAL ALLEGIANCE will perform the debut BLACK SABBATH album in its entirety. Kick off the Halloween weekend at the Brooklyn Bowl in NYC with a night of SABBATH as well as a special set of original METAL ALLEGIANCE songs from the band's two albums. The night will feature Alex Skolnick, Mike Portnoy and Mark Menghi with the vocals being completed by Bobby "BLITZ" Ellsworth (OVERKILL). Joining the special night are JUDAS PRIESTESS, ALEKHINE'S GUN which features Jessica Pimentel of Orange Is The New Black and MAGUS BEAST!